The Metropolitan Museum of Art, New York is exhibiting "The Philippe de Montebello Years: Curators Celebrate Three Decades of Acquisitions". Antiquities feature in the show. Found at Vulci, on the property of Lucien Bonaparte, 1828/29; W. W. Hope (Jean de Witte, Description d'une collection de vases peints [Paris, 1837], no. 177); sale, Christie's, London, February 13, 1849 (Archäologische Zeitung 10 [October 1849], col. 100, no. 74); second marquess of Northampton; sale, Christie's, London, July 2, 1980, no. 39; Mr. Fritz Bürki, Zurich. It was then purchased by The Bothmer Purchase Fund, and Norbert Schimmel Foundation Inc. and Christos G. Bastis Gifts, 1981. European private collection and market, 19th and early 20th century; London market, late 1970s; [Robin Symes, London, by 1983]; sale, Sotheby's, New York, May 20, 1983, lot 142; Mrs. Barbara Johnson, Princeton, N.J.; sale, Sotheby's, New York, December 17, 1992, lot 72. Which European private collection? Which market? Is any of this history documented? [Robin Symes, London, by 1991]; [Acanthus Gallery, New York]; Mr. and Mrs. Morris J. Pinto, New York, 1992–96 (on loan to MMA, 1995–96). Where was the marble head prior to 1991? Had it, too, resided in some old European collection? Robin Symes also presented a terracotta figure to the MMA (though it does not feature in the exhibition). 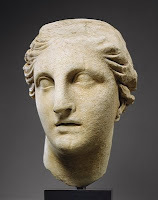 Head of Athena, late 3rd–early 2nd century b.c.